WCCLS: News & Events: Going on vacation? Put your library holds on pause! Going on vacation? Put your library holds on pause! So you found something you want to check out at the library, but there was already a waiting list. You put the item on hold, but now you’re headed out of town for a few weeks. Of course you don’t want to miss picking up your long-awaited hold while you’re gone! 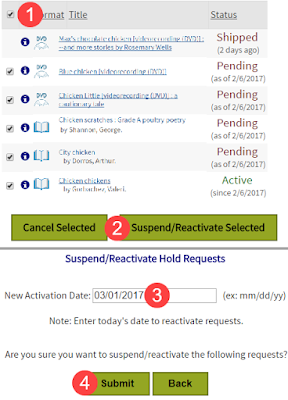 Once you’ve logged into your library account, click on Requests. Click the checkbox to select all in the upper-right hand corner of the list. You can pause any items that haven’t already shipped to you. Click the Suspend/Reactivate Selected button. Enter the date you will return. You will notice the status of these items changes to “Inactive” with the date listed of your return. While you're away, you will keep marching up the holds queue until that date. At that time, your holds will be shipped to the library you selected, if you are first in line by then. Check out this 1.5 minute video for more details!